A work injury in California may entitle the injured laborer to various types of remedies. California work injury attorney Steve Sweat addresses some of the more common questions related to work injuries in Los Angeles and the state of California. Because so many accidents and injuries occur at the workplace or while a person is acting on behalf of their employer, the question often arises as to the difference between a workers compensation and a personal injury claim under California law. These are two distinct types of legal claims and sometimes there is overlap. What is a California Workers Compensation Claim and to What is the Injured Worker Entitled? If a worker sustains an “industrial injury”, he or she may be entitled to receive benefits for that injury or injuries through the California workers compensation system. An “industrial injury” is an injury sustained during the course and scope of their employment (i.e. while doing a task for their employer or at their employer’s direction). This usually entitles the person to some basic benefits as follows: (1) Temporary Disability payments (under California Labor Code section 4653) for lost income while the injured laborer is out of work; (2) Payment of all medical bills; (3) a permanent disability award at the end of the case based upon a calculation of residual injury associated with each affected body part adjusted by the worker’s future earning capacity; and (4) Supplemental Job Displacement Benefit if worker cannot continue to perform his or her prior job function. If the industrial accident causes the worker’s death, his or her immediate family may also be entitled to death benefits under the law. What is the Process for Making a Workers Compensation Claim in California? 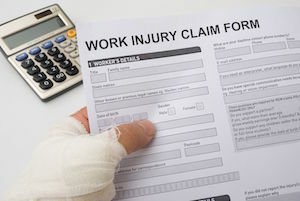 Under California law, the employer is required to provide any employee injured on the job with a workers compensation claim form within one working day after the claim has been reported. The employee is required to complete the “employee” portion of the form and should fully and completely describe each and every body part that was injured. Sometimes the employer fails to provide this form or information about filing a claim, in which case the worker can either obtain a form from Information and Assistance Officer or retain an attorney to file the appropriate claims paperwork on their behalf. If the injured employee feels like the employer is withholding benefits or otherwise treating them unfairly, it is always best to at least consult with a lawyer for an initial free consultation. In addition, if a work injury causes some type of permanent disability, it is always advisable to get the opinion of an attorney prior to signing off on any settlement agreement that is permanent and legally binding. Payment of Attorney’s Fees in CA work comp cases: Workers compensation attorneys work on a “contingency fee”, which means that they do not need to be paid up front. They will provide their services in exchange for a fee based upon the final disability award. The percentage varies but, is set usually at a maximum of 15 percent of the amount awarded. What is a California Personal Injury Claim and how is This Different From Workers Comp? A personal injury claim is a claim for injuries sustained due to the negligence of another person or entity. This entitles a person to recover money for medical bills (present and future), lost income, loss of future earning capacity, property damage costs for either repairing or replacing any damaged property such as vehicles, and additional compensation for pain and suffering, the loss of enjoyment of life. (For a full explanation as to all damages recoverable in a personal injury claim in California click here). The major difference between a work comp claim and a personal injury claim is the ability to obtain what are known as “general damages” in a personal injury claim. General damages are not awardable in a workers compensation claim. These “general damages” include the economic value associated with pain, discomfort, mental and emotional distress, inconvenience, grief, anxiety and related injury. Oftentimes, this is the most valuable portion of a personal injury claim simply because of the costs of medical treatment and lost income often pale in comparison to the emotional toll that a significant bodily injury can have on a person’s life including their work life, home life, and their personal relationships. Is it Possible for a Person to Have Both a Work Comp Claim and a Personal Injury Claim at the Same Time? Defective products including industrial machinery not manufactured by the employer. Car accidents or truck accidents or heavy equipment mishaps with forklifts or similar vehicles, when caused by a person not associated with the employer even if it happens while the employee is working, entitles the injured person to both workers compensation benefits from their employer and a full personal injury claim against the at-fault driver or their employer. Employment claims for sexual harassment, wrongful termination and other intentional conduct by the employer. Where the employer does not have workers compensation insurance as required by law, a personal injury claim may be filed against the employer for any on the job injury and negligence is presumed under California Labor Code section 3706. Why is it Important to Consult and Retain a Personal Injury Attorney Even if you Have Consulted or Retained a Workers Comp Lawyer? Because it is possible to maintain both types of claims and pursuing a personal injury action may entitle the injured party to much more compensation for pain and suffering damages, it is crucial to consult a personal injury attorney. Many if not most workers compensation lawyers only practice in that sub-specialty as work comp involves practice before an administrative body (rather than the state or federal court system) and is very specialized. If both a work comp claim and a personal injury claim are filed, there are complicated issues regarding liens and reimbursement rights and other complex legal issues that absolutely require competent legal counsel. Therefore, it is important to retain a quality personal injury lawyer who is familiar with the interplay between the two claims and can maximize the amount paid to the injured person.